Along the north side of Trillium Lake there is a tangle of lilypads, and these yellow buds dot the top of the water. WOW!!!!! Awesome photo! Awesome colors and textures! Love it. Beautiful! And such a vivid yellow it is! Lovely post for the Y Day! Enjoy your week! Amazing capture. They almost look like wax. Beautiful. 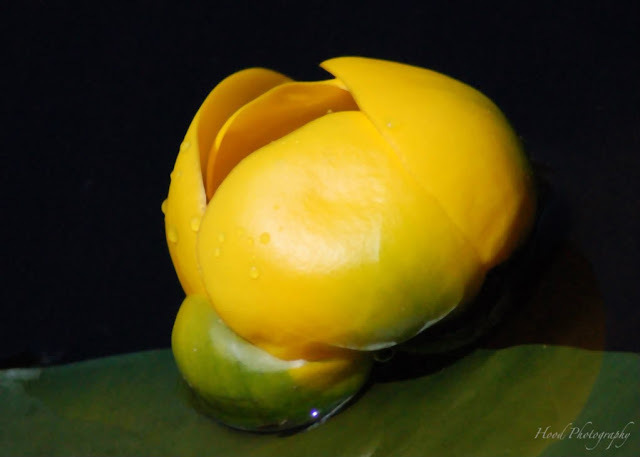 You captured this waterlily so well. Oh my goodness, I thought it was something to eat.... Looks that good. My favorite--and you captured their yellow so well. Isn't it odd & wonderful that they then turn white? GORGEOUS photo! Stunning, in fact. Yellow is such a great "Y." Pure and simple. Love this photo. That's a great photo and a good word--lily has been used but not lily-pad! Good for you.